I am not going to review all the good stuff that all of you already know; we have a number of good players on the team and some superb coaching taking place that will ultimately do something special in three years. A tremendous recruiting and coaching base is being established at Oregon, that — from what I have witnessed thus far — gives me no doubts about Oregon’s eventual success. I have written about the new recruiting profile for offensive linemen, and it is nearly the opposite of what Steve Greatwood had impressive success with. After the recent Saturday Night Live event, offensive lineman Justin Johnson, who stands 6’7″ and weighs 355 pounds, verbally committed to the Ducks. This player fits the new profile of massive, sun-blotting behemoths that the current staff is pursuing. This could open up opportunities for Doug Brenner (322 pounds) and Sam Poutasi (319 pounds), as the new offense emphasizes power, strength and bulk. 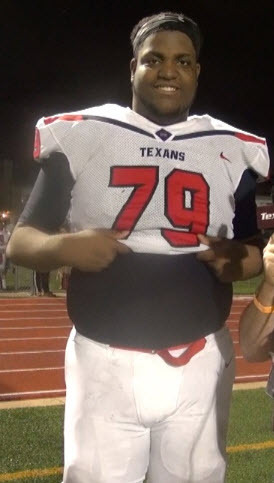 Darrell Simpson is being recruited by Oregon coaches as he is 6’7″ and 340 pounds. And we are light on that. So we are going to run a Power-Spread offense, without the personnel needed on the offensive line? Can we expect more stuffed plays until our line is stocked with the new offensive lineman profile? Now I get that all is not lost, as Tyrell Crosby is 320 pounds, and Shane Lemieux is 316 pounds. So we are perhaps nearly halfway to Mario Cristobal‘s objectives. My point is that we are trying to operate a particular run offense without the right people in place, and the point production will suffer as a result. Like many of you, I felt that offensive coordinator Marcus Arroyo would adjust the playbook to emphasize the drop-back, pro-style quarterback Oregon has in Justin Herbert. I felt good that with Charles Nelson on one side of the ball and Darren Carrington on the other, we could blend in the new unproven receiving talent and gradually bring them along. But now Carrington is gone, and the hole left in the lineup is much bigger this year than it will be in any other future year. Carrington’s loss hurt this offense in a very disproportionate way. I am not disagreeing the decision to dismiss him, as you must be looking to build a team over the long term. But this loss is a killer in the short term, and hence another reason why we will not see Oregon score as many points in 2017 as we will in the future. I love what I’m seeing on defense in the spring game film, and the feedback from the coaches that contribute to FishDuck.com has been encouraging. 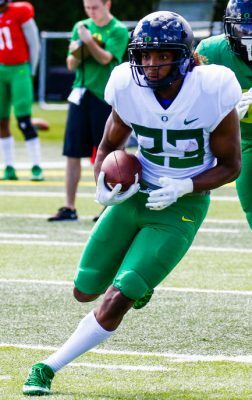 Technique, angles, tackling, intensity and knowledge of assignments is clearly better already, and Oregon has a number of talented players on the defensive side. Scott Pegano while at Clemson. Be honest with yourself. Do we have defensive talent comparable to Washington and USC? And that is just considering what is in conference. 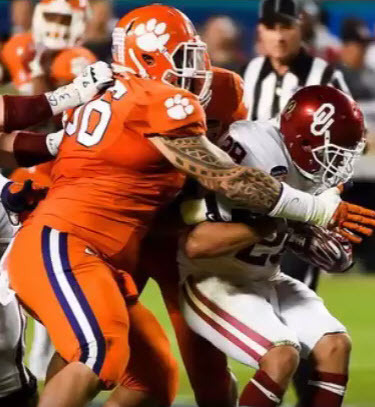 What if we want to be in the playoffs and encounter teams like Ohio State, Clemson (who had such an abundance of defensive linemen that Scott Pagano was easily expendable for them) and Alabama, who had four first-round NFL picks from their defense in each of the last two years? Compare our lineup to that — no, don’t. We are a long way off, and we have to accept reality for what it is. Our schedule does not include USC, but it does have Nebraska, a team that would be in the top half of our conference. It also has an away game (at high altitude) in Wyoming (a terrific coach there) that will be like an extra conference game with a team in the lower half of the Pac-12 (which is where we are projected to be). Another component is the newly created Duck position, which is actually another safety in the game and not as stout as the linebacker who would normally be on the field. I do not object to this change, but it makes us lighter on the field than we already are. Yes, things will get better with the blockbuster recruiting done by Coach Willie Taggart and staff; in the meantime we need to tap the brakes on expectations, look for the improvement and enjoy the journey of the resurgence of the program. I will look for the positives this season and celebrate the baby steps that will become apparent on both sides of the ball. This is why I would feel good with six wins total. If players such as Malik Lovette, Jordon Scott, and Thomas Graham emerge as we hope, we could have a shot at eight wins including the bowl game. However, that is also crossing our fingers, with the injuries that could occur. I really see six wins. If our beloved Ducks do better, it is further confirmation of the incredible coaching staff assembled by WCT. Let’s count our blessings this year and bask in the recent history of the program, and the knowledge of where we are headed.